In the years before her life was uprooted by Burma’s military junta, Htoo Eh was a primary grade school teacher in Tay Dey, a village in southern Burma. She and her husband Kle-Klo Say had been married four years and had had two children before deciding their village was no longer safe, due to constant bombardment from the Burmese Army. Though the family was frightened, they were prepared for the arrival of the brutal military regime; inside their home was an emergency kit stocked with clothing and a few pounds of rice, ready for when the family had to flee at a moment’s notice. The family travelled for one month through the jungle, resting on the ground of the dense forest. However, at each place they took respite, they would again encounter the Army and were forced to run off. Soon the family reached an area of the forest known as Ee Hto Hta. There, Htoo Eh and Kle-Klo Say created a makeshift home from bamboo. They stayed in their new “home,” for three months then decided the only way to remain safe was to go to a refugee camp in Thailand. 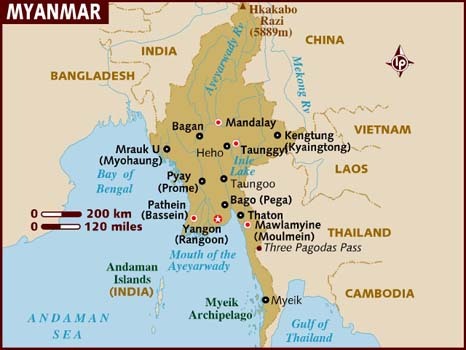 However, by then, the Thai government had closed the Thai-Burma border where the camps were located so access to the camps was stopped. Their only choice then, was to sneak in. It was an extremely risky move; risky because the Burmese border was only 2.5 miles from the camp. However, the family arrived at the Mae La Oon refugee camp in northern Thailand in 2006 after successfully traversing the carefully guarded Thai border. Though there were wooden houses set up in the camp, they were incredibly overcrowded, offering no privacy for the small family. So, like before, they constructed a bamboo hut for shelter. It was in the camp, in 2007, that their second daughter – Eh Htee Say – was born. The conditions of the camp were hardly sanitary, consequently, every few weeks the children got sick. A year after their youngest daughter was born, the family experienced another hardship. Htoo’s husband, Kle Klo Say became sick and never recovered. In 2008, after seven years of marriage and three children, he passed away leaving the family fatherless. Throughout the ordeal, Htoo Eh maintains that she was, of all things, lucky. Lucky to have arrived at the Mae La Oon camp when she did, for her family was among the very last group able to register for resettlement with UNHCR since 2006; thus their 5-year process of coming to the United States began. Htoo Eh arrived at Chicago’s O’Hare Airport on November 3, 2011 with her three children – Soe K’ Paw Shee (9), Shee Say (7), and Htee Say (4) – and younger brother, Day Htoo (18). She is grateful for the chance she has been given. Here, her children have not been sick and are attending school. She says their apartment is warm and there are more than enough clothes for her and her family. Her Baptist roots bring her to church every week, helping her to handle the challenges she faces in Chicago. She wholeheartedly appreciates the churches that helped co-sponsor her family. She is humbled by their collaborative efforts to furnish and set up the apartment before the family’s arrival. Their generosity has helped the family begin to live their new lives of safety, dignity, and self-reliance in the U.S.
She dreams of the day when her mother and sister, who are still in the Thailand camp, will join her in Chicago. She is eager to learn English so she can get her high school diploma. Although she is currently searching for any type of job, she hopes to one day return to her teaching roots. And on her left hand, with painted nails, she still wears the wedding ring that was given to her a decade ago. Htoo and her family moved to Arkansas where, through a relative, she was able to find employment in the manufacturing field. 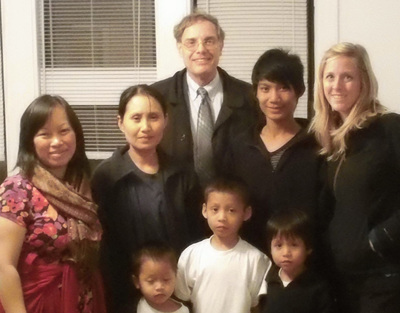 Your financial contribution will assist in the resettlement of families like Htoo’s.